Downtown San Jose’s first community bike shop is now open four days per week! Come on down! We’re located at 19 North Second Street, Suite 101. Enter through the door to the left of Angelou’s, head down the hallway, and find us on the right. We have stands, all the tools you’ll need for the most common repairs, and some spare parts. These initial soft-opening hours are a great time for you to start making use of your membership, accessing the tools, volunteer knowledge and shared space for bike repair you’ve been waiting for. 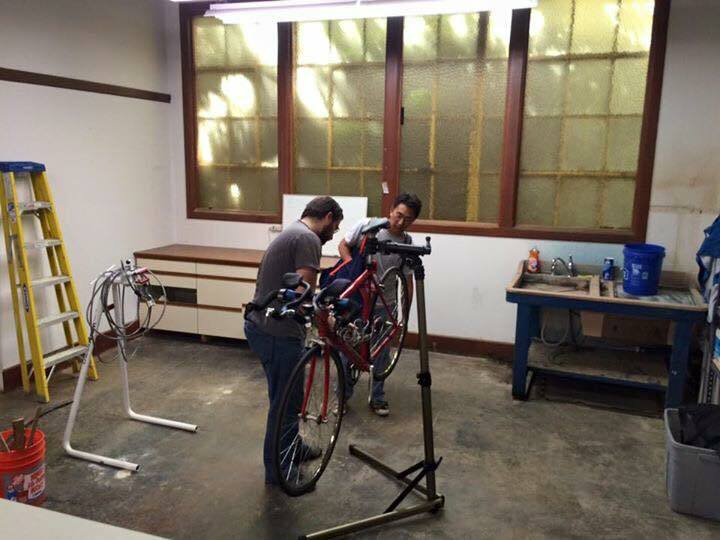 Some of the first volunteers to wrench on a bike in our new space. Our volunteers will be continuing to build out the shop and work out the kinks, so we thank you for your patience and understanding during this soft launch period. We also invite you to pitch in and join the team. Just email sjbc@bikesiliconvalley.org or attend one of our workdays on Tuesdays from 7-8:30 pm if you’d like to help. As always, we’re staffed by volunteers, each day made up of two 2-hour shifts: 4:30 to 6:30 and 6:30 to 8:30. We’re filling out our schedule over the coming weeks to the point where every shift has at least two volunteers. If you’d like to join the team, please sign up for shop shifts in this form. Whether you have bike repair skills or not, we’d be grateful to have a couple of hours of your time whenever you can spare it. This entry was posted in Uncategorized by Cody. Bookmark the permalink.